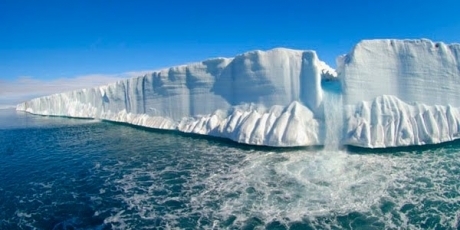 Avaaz - Donate to support our climate work! Donate to support our climate work! Some time ago, a scientist went on his annual tour of the Russian Arctic Ocean, checking for noxious plumes of methane gas bubbling up from the ocean. He'd previously seen hundreds of these plumes, about a metre wide each, emitting gas 50 times more damaging to our climate than carbon dioxide. This time, as he came across the first plume, he couldn't believe it. It was a KILOMETRE wide. A vast column of gas entering our atmosphere. He sailed on and found another a kilometre wide, and another, and another. Hundreds of them. This could be what the experts warned us about. As the earth warms, it creates many "tipping points" that accelerate the warming out of control. Warming thaws the Arctic sea ice, destroying the giant white 'mirror' that reflects heat back into space, which massively heats up the ocean, and melts more ice, and so on. We spin out of control. In 2014 everything was off the charts -- it was the hottest year in recorded history, and 2015 is well on course to beat even that! The Paris Summit is the most important climate meeting of the decade. In September 2014, our community helped spearhead the People’s Climate March putting 700,000 people on the streets with other organisations and injecting vital momentum into the climate movement. On November 29th we're doing it again, all over the world, and bigger so that we can hold our leaders accountable to agree a safe course for our one world. It's us vs. the oil companies and fatalism. We can win, we must, but we need to throw everything we have at December's summit. With donations of just a few dollars/euros/pounds we'll be able to massively scale up our work. For the world we dream of, let's make it happen.